Ben Dowdle is an amazing young 20 year old who has been at the front line of the Unmask Palm Oil campaign since he was 16. I got to talk to Ben at the Wellington Zoo last week and it was news to me that even if we are buying anything with vegetable oil there is no guarantee that this is not Palm Oil. AAARgh so my family is still unknowingly contributing to rain forest deforestation. 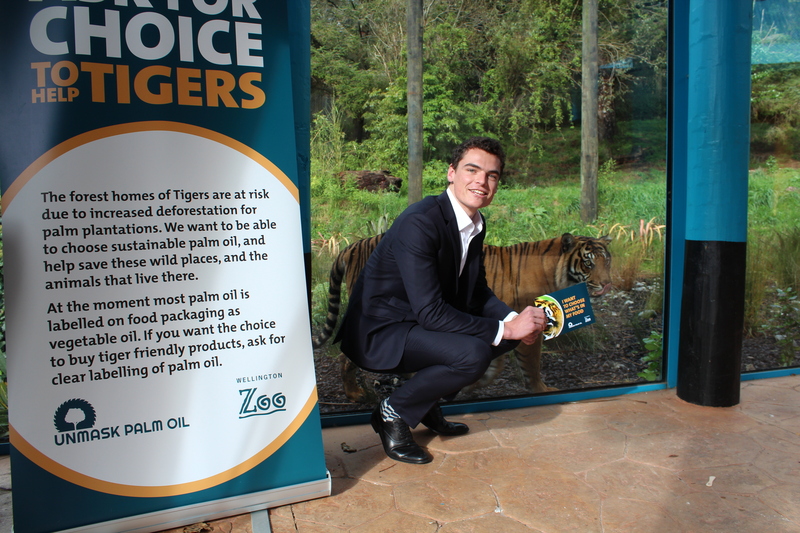 In this interview Ben’s talks about the problem and the solution, mandatory labelling of palm oil, that he has been campaigning for across New Zealand and every state of Australia. It is interesting that most of the rest of the western world has taken this up and of course sustainable Palm Oil plantations are the result. Or you can go the Wellington Zoo by May 22nd, where they have a card you can sign, up by the Sumatran tigers, who are already at great risk while the deforestation for Palm oil continues. Wellington Zoo is proud to support the Unmask Palm Oil campaign by asking government representatives in New Zealand and Australia to demand clear labelling of vegetable oil on all food products. Palm oil is estimated to be in about half of all products available in supermarkets, but most are labelled as ‘vegetable oil’. Mandatory labelling will allow consumers to make informed choices about the products they buy. The wild homes of critically endangered species, like Sumatran Tigers, are at risk from deforestation, as large areas of their habitat are cleared to make way for large palm oil plantations in South East Asia. However, palm oil can be produced without deforestation. Wellington Zoo and Unmask Palm Oil support the use of Certified Sustainable Palm Oil (CSPO), which certifies palm oil plantations to ensure they are deforestation free. While boycotting all palm oil may seem like the obvious solution, we believe a boycott will only shift the problem to other parts of the world and onto oils which are less productive than palm oil, therefore requiring more land. A consumer wanting to make the switch from conventional palm oil in order to demand Certified Sustainable Palm Oil (CSPO) will soon discover that Australasian labelling laws make it nearly impossible to make this simple ethical choice. Mandatory labelling will help us to choose sustainable palm oil – and, in turn, help Sumatran Tigers and countless other animals that rely on these wild habitats to survive. If you’d like to choose what’s in your food, come to Wellington Zoo this autumn. We have a community action station in the Asia Precinct until 22 May, where you can send a postcard to Minister Jo Goodhew, asking her to vote ‘yes’ to clear labelling of vegetable oil on products. This entry was posted in Environment and tagged Climate Change, Conservation by lauriestarfish. Bookmark the permalink.